Recorded as from Stonington, Connecticut. Descended in the family of the sitter. (Victor Spark, New York), by whom sold in 1947 to Edgar William and Bernice Chrysler Garbisch; by bequest to NGA, 1980. American Primitive Paintings from the Collection of Edgar William and Bernice Chrysler Garbisch, Part I, National Gallery of Art, Washington, 1954, no. 22. American Primitive Paintings, National Gallery of Art, Washington, D.C., 1955 (replaced temporarily for part of exhibition). Paintings from St. James' Collectors, Wildenstein Gallery, New York, 1955, no. 18. American Folk Art. Part of American Art. Four Exhibitions, Brussels Universal and International Exhibition, Belgium, 1958, no. 48, 37, repro. 36. 101 Masterpieces of American Primitive Painting from the Collection of E.W. and B.C. Garbisch, traveling exh. by the Amer. Federation of Arts, New York, 1961-1964, no. 19, color repro. First venue: The Metropolitan Museum of Art, N.Y.
Fifty Masterpieces of American Primitive Painting from the Collection of Edgar William and Bernice Chrysler Garbisch, Society of the Four Arts, Palm Beach, Florida, 1967, no cat. American Naive Painting of the 18th and 19th Centuries: 111 Masterpieces from the Collection of E.W. and B.C. Garbisch, traveling exh. by Amer. Fed. of Arts, N.Y., 1968-1970, no. 27, repro. First venue: Grand Palais, Paris. The New World: 1620-1970, Chrysler Museum of Art, Provincetown, Massachusetts, 1970, no. 6. 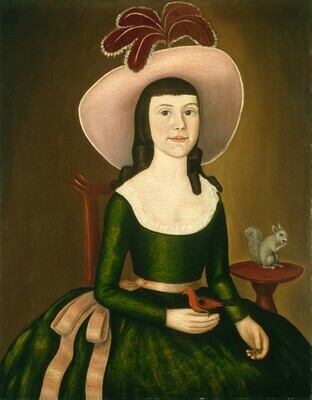 American Naive Paintings from the National Gallery of Art, traveling exhibition by the International Exhibitions Foundation, Washington, 1985-1987, no. 24, color repro. First venue: Museum of American Folk Art, N.Y.
La Nascita di Una Nazione: Pittori americani dalla National Gallery of Art di Washington 1730-1880, Palazzo Pepoli Campogrande, Bologna; Galleria Internazionale d'Arte Moderna di Ca'Pesaro, Venice, 1988-1989, no. 24, repro. Little, Nina Fletcher. "Little-Known Connecticut Artists, 1790-1810." Connecticut Historical Society Bulletin 22 (October 1957): 100-101. Warwick, Edward, Henry Pitz, and Alexander Wyckoff. Early American Dress: The Colonial and Revolutionary Periods. New York, 1965: 96. Black, Mary and Jean Lipman. American Folk Painting. New York, 1966: 20, 21, 35. Schloss, Christine Skeeles. The Beardsley Limner and Some Contemporaries: Postrevolutionary Portraiture in New England, 1775-1805. Exh. cat. Abby Aldrich Rockefeller Folk Art Center, Williamsburg, Va., 1972: 36. Harlow, Thompson R. "The Life and Trials of Joseph Steward." Connecticut Historical Society Bulletin 46 (October 1981): 111, 117, 126, 129. American Paintings: An Illustrated Catalogue. National Gallery of Art, Washington, 1992: 158, repro. Chotner, Deborah, with contributions by Julie Aronson, Sarah D. Cash, and Laurie Weitzenkorn. American Naive Paintings. The Collections of the National Gallery of Art Systematic Catalogue. Washington, D.C., 1992: 88-90, repro. 89.